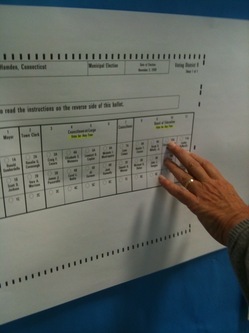 Is A Flaw In The Ballot Connecticut’s Butterfly? It’s likely with all the elections going on in the state someone’s getting jobbed by this. I hope not, but I’m a realist. People vote without reading. I voted today, but I’m not totally happy about the process. There’s a flaw in the ballot which will leave some people with the wrong impression and others just confused. It’s possible votes will be miscast or candidates deprived of potential votes. This isn’t the kind of thing which benefits one party over the other, but it does penalize anyone with the bad luck to be placed over or under a candidate with good name recognition. Is this another butterfly ballot debacle? Maybe. I think it is significant. In my town an example is the vote for members of the School Board. Eight candidates presented in two rows and four columns. It seems logical that if you vote for one candidate in a column you shouldn’t be able to vote for the other–but you can! Yes, there’s an instruction to vote for any four candidates, but I think the history of voting for just one candidate in a column trumps anything written. That’s reinforced by the candidates being ‘numbered’ as 9a, 9b, 10a, 10b, etc. And, since this is now a paper ballot using an optical scanner there’s no longer the reassurance of seeing if the lever will pull. This is just plain bad. There has to be a better solution, though I don’t know what it is. That last sentence originally read “Lots of people vote without reading,” but my polling place was an invitation only crowd. Such a shame. I don’t think I’ve missed a single election since 1972. In other election news… the sixth grade class at the elementary school where I vote has taken to holding an election day bake school. Smart kids! They get a captive audience hungry or guilty or possibly both. Soon they’ll come to school in a Lexus school bus. Not only that, but with the optical voting method, the machine that you feed your ballot into at the end suspiciously looks (and acts) a lot like a paper shredder! The new ballot is a mess. There was a charter revision question in Danbury’s and I almost missed it. And selecting multiple people is confusing on the new forms. I’d rather have the old machines than this stuff. And I also thought the readers would catch if you voted for different candidates in the same column if you were only allowed to vote for ONE person…for multiples it is allowed I believe.